Below we reproduce a detailed post outlining what happened with the Basslink cable that connects Tasmania to the mainland for internet and electricity. Being an island Tasmania is very dependent on the mainland for things that we cannot produce enough of ourselves, and obviously with the internet we want to connect to the rest of the world. Tasmania has 3 under water data cables connecting us to the mainland – two owned by Telstra and one operated by Basslink. The Basslink cable brought competition to the market and forced prices down. There are still quite a few ISPs that refuse to operate in Tasmania because the cost of transporting data from Tasmania to the mainland is very expensive compared to comparable distances on the mainland. We also both sell electricity to the mainland when our dams have enough water and at times purchase electricity from the mainland for ourselves. Approximately 6 months ago a fault developed in the Basslink cable and the cable had to be cut and repaired. This is not a simple task – first and the hardest part is that you have to find the faulty section of the cable so you can remove and replace it. That proved to be extremely time consuming and very very expensive. Tasmania has been suffering power rationing and internet access issues for 6 months and is only back to normal now. All ISPs had to use Telstra facilities during this period and some ISPs such as the TPG group which includes iinet and Internode refused to purchase enough capacity from Telstra meaning their service has been sub standard for a long time. We were also under a serious threat of running out of electricity until the recent rain came and restored our dam levels. Tasmania generates its electricity through Hydro power usually though a gas powered plant was reinstated during the Basslink outage. Tasmania in fact had to ship in hundreds of diesel powered generators just to provide us with electricity! You will also find that shipping products from the mainland can not only be more expensive but take longer than shipping around the mainland. As a purely personal note we are extremely lucky that shops such as Dan Murphy offer an unlimited shipping plan at very good rates for deliveries to Tasmania! With limited fanfare, Basslink resumed operation this week for the first time in almost 6 months. Basslink is Tasmania’s proverbial umbilical cord – a 500 megawatt submarine HVDC cable that connects to the mainland providing both electrical power and data exchange. Its failure back in December last year resulted in an unprecedented energy crisis in the Apple Isle. To help avert the crisis 200 diesel gensets were installed at a cost of around $44 million. The moth-balled, gas-fired Tamar Valley Power Station was bought back online, and deals were brokered with large industrials to cut back on their energy consumption. Some analysts have estimated the total cost of the crisis at around $400-500 million (see also). So with Basslink’s resumption the process of repairing the damage begins. Notwithstanding the immense flood damage, drenching rains in May followed by torrential rains in early June have helped stymie the energy crisis. With HydroTasmania’s smaller catchments now overflowing, many of its run-of-river power stations are operating at more-or-less full capacity. In a matter of a few short weeks Tasmania has gone from acute energy shortage to excess. Basslink flows for the 4 days period June 13th – 17th. Re-connection occurred on June 13th, around midday. Flows are in megawatts and are positive northwards. Basslink failed on December 20th 2015. 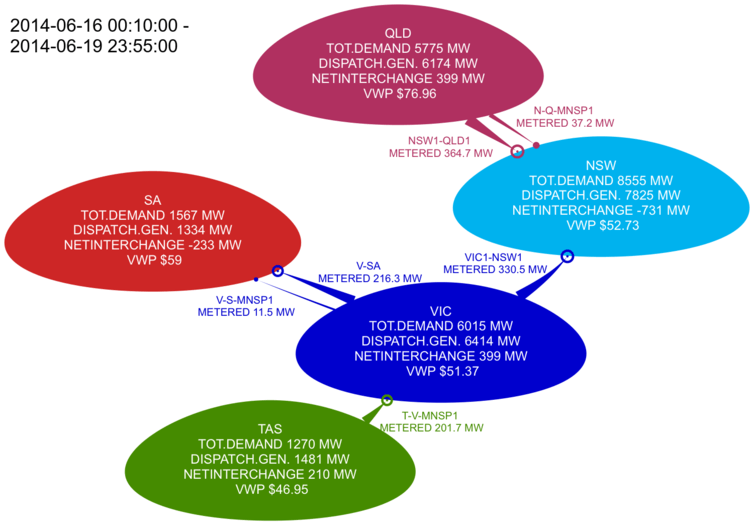 Data from AEMO 5-minute dispatch tables. Meanwhile, the larger hydro catchments such as Gordon have received much needed replenishment. Total storage has doubled over the last six weeks to 27%, increasing at a near record rate of about 2% per week. Storages are now back to levels comparable to mid June in 2014 and 2015. Tasmanian hydro storage as percentage of total capacity. Data from HydroTasmania. Yellow diamonds show mid-June levels for each year since 2008. Because of the recent rains and the excess power production, Basslink has this week been flowing northwards into Victoria at an average of about 140 megawatts and, at times, as much as 350 megawatts. That represents about 10% of total Tasmanian dispatch, none of which is being contributed by the emergency 200 diesel generators that were bought in to deal with the crisis, and only a tiny bit from Tamar Valley and Bell Bay gas units. 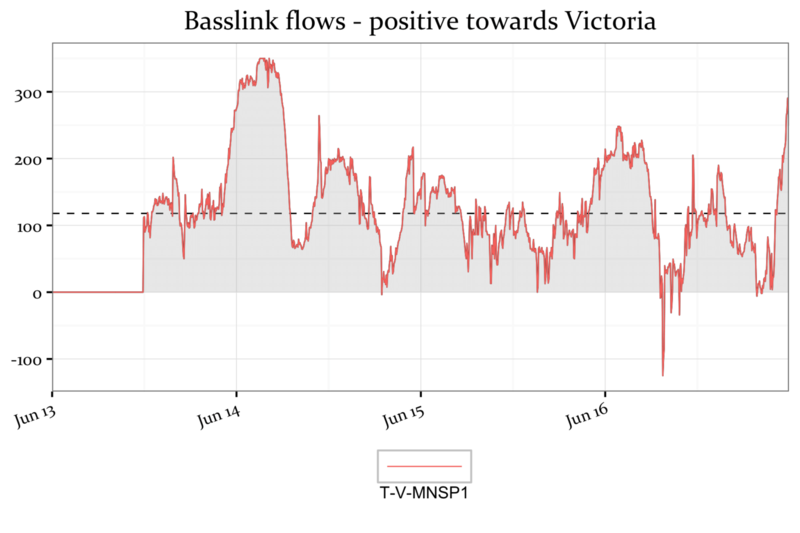 With mainland wholesale prices now averaging around $90 per megawatt hour, HydroTasmania will be relishing Basslink’s resumption. Now that the rains have come, their prayers will be for those prices to remain high. Such is the crazy brave new world of energy supply, HydroTasmania’s exports are now worth around $2 million a week. Map of power flows across the 5 state regions in the National electricity map including interchanges for the period 14th-17th June. Note the prices for this period have averaged close to $100 per megawatt hour in volume-weighted terms. Negative values for NETINTERCHANGE imply imports, positive values exports. Data from AEMO’s 5-minute dispatch tables. However, with mainland prices currently way above what they were even in the Carbon-tax years, questions will be asked. Why they have risen so much? If we factor out the contribution of the carbon tax, prices in New South Wales and Victoria are almost three times what they were in the comparable period two years ago. Some pundits will no doubt point to recent changes in the South Australian market, following the closure of the Northern Power Station in Port Augusta. However with the national electricity flows mostly converging on New South Wales, the drivers for price setting their would appear much more important. 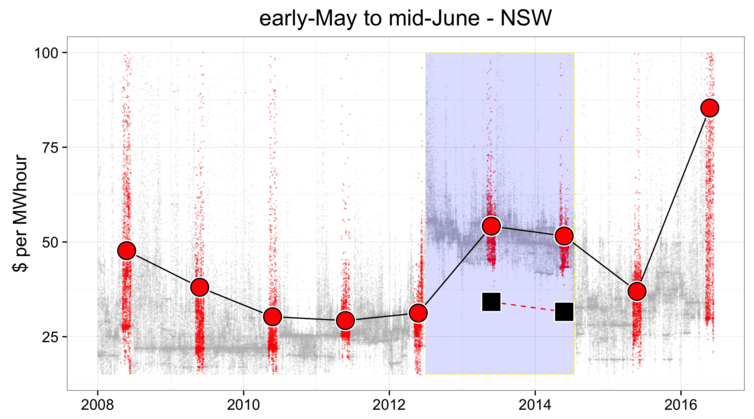 NSW volume weighted wholesale prices for the 6-week period early May to mid June, 2008 on, shown in red circles. Half hourly prices are shown in small background including the subset for the 6 week period shown in red. Black squares show the carbon tax years adjusted downwards by removing the carbon price (assumed at $20 per megawatt hour). Data from AEMO half hour price and dispatch tables. 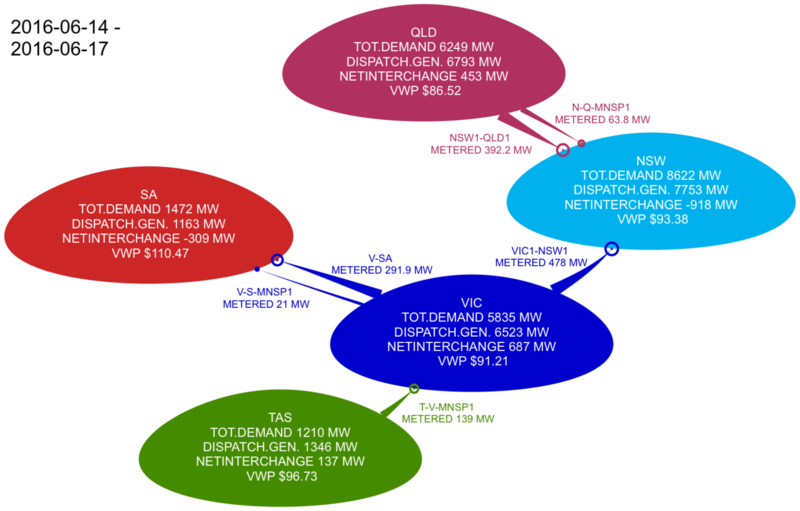 And as indicated in the two maps shown above, there have been no obvious changes to the demand and dispatch settings in New South Wales over the last 2 years. So with no obvious reason for such a price spike, it wouldn’t surprise if the regulators were taking a keen interest, not to mention large energy consumers with market exposure. I doubt HydroTasmania’s latest prayers will be answered in the short-term. At least not until we see some major structural transformation in mainland generation, such as the closure of one or more of the Latrobe Valley brown coal generators. With the Victorian Government this week setting ambitious targets to generate 25% of its electricity from renewable energy by 2020, and 40% by 2025, that may not be very far away. 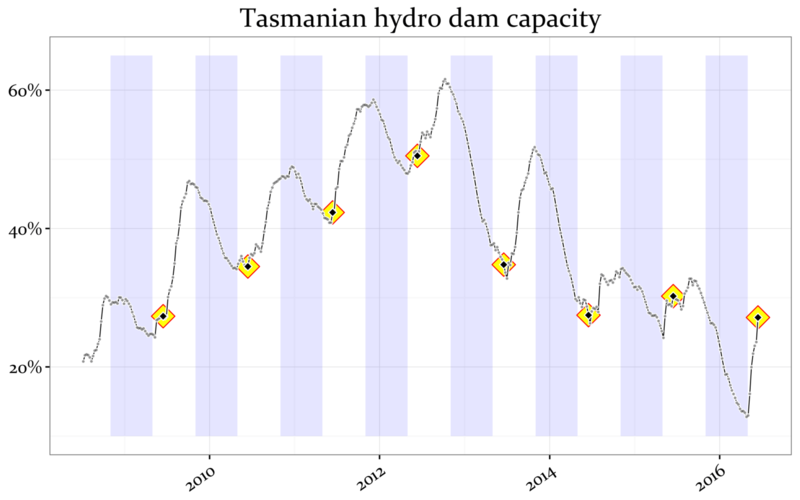 When that happens, HydroTasmania will be hoping its dams are full and Basslink is operational. And by then I hope the Apple Isle has invested more in its exceptional wind resource.